Stanford Advanced Materials (SAM) is a trusted supplier of various chemical products. Now we offer 3-Methacryloxypropyltrimethoxysilane/3-(Trimethoxysilyl)propyl methacrylate which can be used in industries. 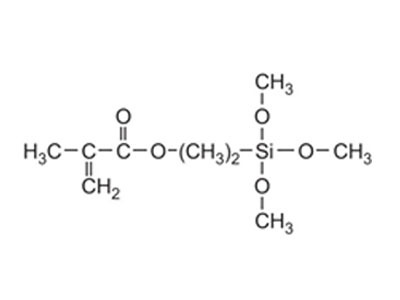 The silane 3-methacryloxypropyltrimethoxysilane is one of the oldest and still one of the most important coupling agents available for improving the practical adhesion of polymers to minerals. It has also featured strongly in research and development studies establishing the dominance of the chemical bonding theory as the primary mechanistic explanation of silane coupling agent effectiveness. Chemical properties: Colorless transparent liquid, soluble in many organic solvents, insoluble polysiloxane can be formed after the hydrolysis solidification. 3-Methacryloxypropyltrimethoxysilane is mainly used to improve the adhesion between the surface of organic material and inorganic material, such as the glass fiber of glass steel and plastic, rubber, paint, coatings of siliceous filler materials, as well for adhesive to increase bonding properties. The adapted resin includes epoxy, phenol formaldehyde, melamine, polysulfide polyurethane and polystyrene. It is also used in unsaturated polyester composite materials, which can improve the mechanical properties of the composite materials, electrical performance, transmission performance, especially the wet property of composite material.